The Casentino Valley is rich with history, art, good food and outdoor activities. Lying approximately 50 km to the east of Florence, this isolated valley offers opportunities for visitors of all ages visiting castles, trekking through centuries-old forests, tasting authentic recipes and discovering many of the best kept secrets from locals. 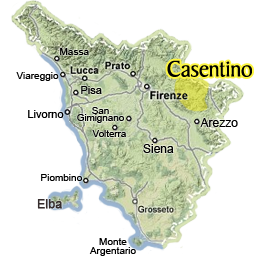 We invite you to come explore Casentino with us! Some of the places to see include: the castles of Poppi, Romena and Porciano, the Franciscan sanctuary of La Verna, the monastery of Camaldoli, the zoo in Poppi and the small towns of Stia, Pratovecchio and Castel San Niccolò. The Casentino Valley, rich with history, art, good food and outdoor activities, is the ideal destination for a full immersion in Tuscany. Located approximately 50 km from the city center of Florence, this isolated valley offers opportunities for visitors of all ages: visit castles, trek age-old forests and taste authentic recipes. The Poppi Castle in Casentino Tuscany is the ideal place to visit for tourists of all ages. The castle offers intrigue, the opportunity for exploration and an ideal place to relax and enjoy the Tuscan culture, food and atmosphere. Go beyond the art, the culture and the classic landscape of Tuscany and delight in the spectacular colors of fall. The brisk temperatures bring not only a richness in the flavours that invade the menus but also a kaleidoscope of falling leaves in dazzling shades of yellow, red and orange which can be best appreciated up close. Not too far away from Florence is a valley filled with castles to explore. The Castello di Romena is one of the four picturesque structures located in the Casentino valley perfect for an afternoon of exploration, history and good times. The castle is a stunning backdrop to the quaint little town of Stia. It is possible to visit this privately owned tower castle and museum to get a glimpse of the history behind the Casentino valley, the noble Guidi family and the present owners. A virtual visit to the Franciscan Sanctuary of La Verna in Casentino where St. Francis of Assisi received the stigmata, a special spot for spiritual retreats surrounded by nature. The origins of the abbey and the national reserve Vallombrosa dates as far back as the year 1039. Only a short distance from Florence, you can visit the monastery complex and the surrounding forests for a special peak at Tuscany’s diverse fauna, forest trails and spiritual heritage. Relax in a genuine corner of Tuscany at Borgo La Casa, near the Castle of Poppi & the immense national park of Casentino. Two private villas rentals for up to 10 persons promise a panoramic pool close to small towns, historical sites, quality shops & restaurants.